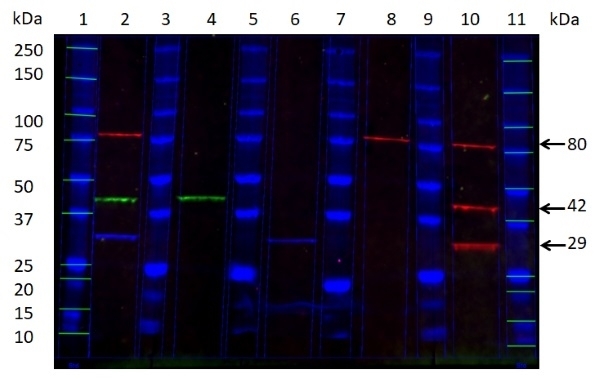 Detection of isotype specific mouse primary antibodies by western blot analysis. 25 μg of HeLa cell lysate spiked with a primary antibody mixture of Mouse IgG1 anti actin beta (VMA00048), Mouse IgG2a anti PCNA (VMA00018) and Mouse IgG2b anti ezrin (VMA00344) each at 0.5 μg/ml were run in lanes 2, 4, 6, 8 and 10 under reducing conditions on SDS PAGE using the Bio-Rad V3 system and transferred to PVDF membrane. Bio-Rad Precision Plus MW marker was run in lanes 1, 3, 5, 7, 9 and 11. Mouse anti actin beta (VMA00048) 42 kDa, was detected using Human anti Mouse IgG1 conjugated to DyLight488 (clone AbD24121, HCA309D488) in lane 4. Clone AbD24121 does not recognize Mouse anti PCNA IgG2a or Mouse anti ezrin IgG2b. Mouse anti PCNA (VMA00018) 29 kDa, was detected using Human anti Mouse IgG2a conjugated to DyLight650 (clone AbD24124, HCA310D650) in lane 6. Clone AbD24124 does not recognize Mouse anti actin beta IgG1 or Mouse anti ezrin IgG2b. Mouse anti ezrin (VMA00344) 80 kDa, was detected using Human anti Mouse IgG2b conjugated to DyLight550 (clone AbD24127, HCA311D550) in lane 8. Clone AbD24127 does not recognize Mouse anti actin beta IgG1 or Mouse anti PCNA IgG2a. 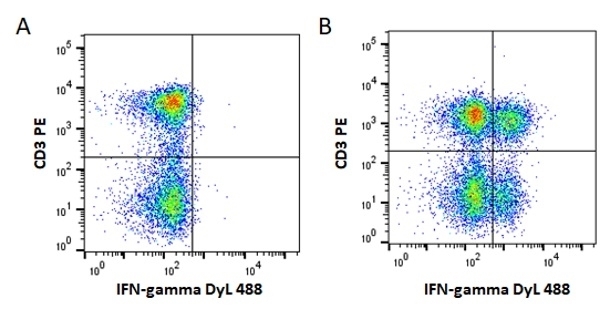 Goat anti Mouse IgG antibody conjugated to Dylight549 (STAR117D549GA) was added to lane 10 as a standard antibody which detects all three isotypes. 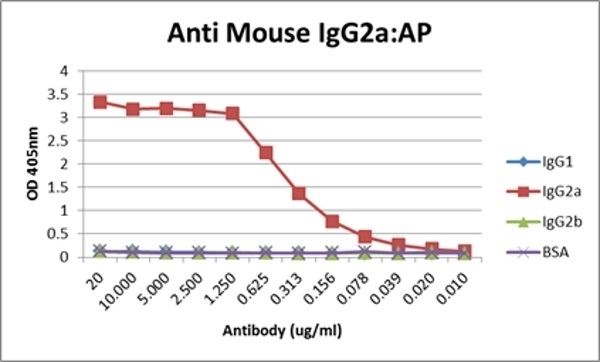 Human anti Mouse IgG2a monoclonal antibody, clone AbD24124, recognizes the IgG2a isotype of the primary antibody, with no species cross reactivity against mouse IgG1 and mouse IgG2b primary antibodies. This antibody allows for more than one unlabelled mouse monoclonal antibody to be used at any one time permitting multiplexing.